Light + Love : Reminiscing. I have been reminiscing (and blogging) about Beijing in my travel blog. What's nice about writing this trip months after it happened is that I get to relive them. It feels almost like I am there again, in that particular place, in that very moment. I give out a smile each time I browse through all the pictures again. This is Beihai Park. When I was there, I remember thinking: "I could actually live here." I loved all the charming little corners, the architecture, the paintings on the walls, the covered walkways, the lovely gardens. This is the scenery I imagine in fairytale storybooks. Okay, maybe, I watched too much chinese tv series as a kid. Remember The Twins? I think my love for kungfu and Jackie Chan started there. 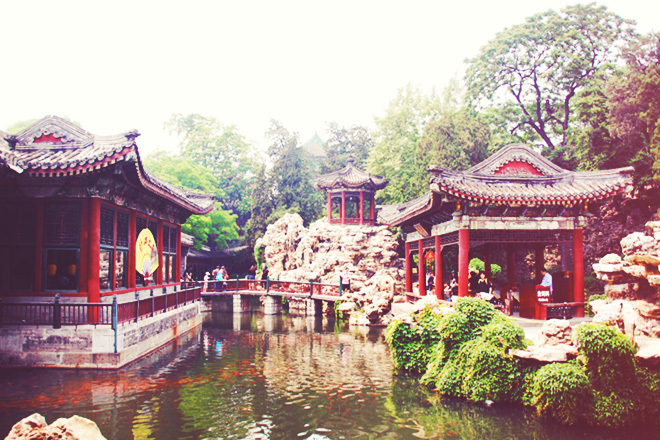 When you ever visit Beijing, do not miss Beihai Park.